Week ending 2nd November 2018. 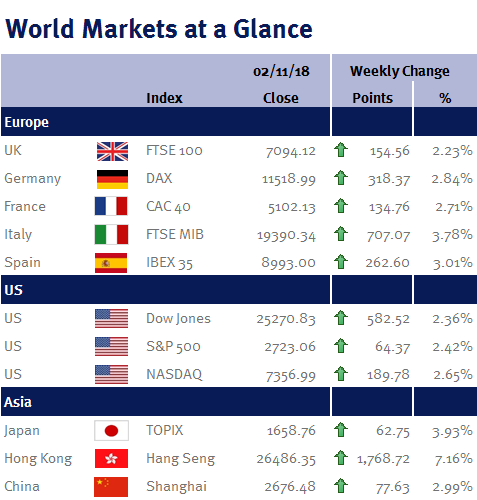 After an arguably healthy pullback in US markets in October, global markets have started November in a positive fashion; ending this week higher ahead of the crucial US mid-term elections next week. The UK Chancellor of the Exchequer, Philip Hammond, announced the UK Budget on Monday. Whilst it was relatively uneventful, there were some key takeaways. The personal allowance threshold and higher rate tax thresholds are to rise to £12,500 and £50,000 respectively from April 2019. In addition, we will see a 4.9% rise in the National Living Wage to £8.21. Funding for government services was also addressed, seeing £1billion committed to the armed forces, and a further £160million towards antiterrorism police forces… not leaving out the NHS which has had a 5 year commitment to receive £20.5billion in funding with a focus on building out mental health capabilities countrywide. Aside from the NHS, another commitment that will be close to many of our hearts will be the £30billion of funding pledged to improve UK roads, of which £420million has been dedicated to local authorities to fix potholes. This will come as a welcome relief to many as we struggle to navigate roads not knowing where the definition of a ‘pothole’ ends and ‘sinkhole’ begins! Any meaningful amends to the road network should aid in reducing public expense in addition to aiding in reducing corporate vehicle maintenance costs amongst other things. The UK’s Monetary Policy committee met on Thursday with no change to policy meaning headline interest rates remain at 0.75%. However, Mark Carney’s (Bank of England Governor) comments were probably the most notable seeing him warn about the potential inflationary shock of a ‘no-deal’ Brexit. This came in a week where Theresa May’s Brexit Secretary, Dominic Raab published a letter suggesting that a Brexit deal would be merely weeks away, only to retract the statement shortly after. So, whilst Carney’s warning is a worst case scenario, it can be taken as a warning to the government that uncertainty around the shape Brexit will take still remains! The US is in amidst of earnings season which has been key to broader market movements this week. Following weak results from Amazon last week, a strong set of 3rd quarter earnings released by Facebook on Tuesday aided to propel markets off their trough, following what could arguably be described as a healthy pullback. This pullback evidently has some sustainability as it remained robust despite Apple’s weak 4th quarter forecasts (which was accompanied by equally weak guidance), so whilst one should remain tentative about the US market taking off strongly again, this could aid as a catalyst to springboard attractive valuations in other global markets, perhaps presenting a buying opportunity should it prove to be so! After all, everyone knows that an investor should buy at the bottom and sell at the top, but it proves a difficult decision for them to do so… however the current climate when coupled with the US market reversion in October presents a strong opportunity. On Sunday we had the conclusion to an incident packed Brazilian election. Far Right Populist Jair Bolsonaro won with over 55% of the votes. His victory signifies that the Brazilian public are fed-up with the corruption riddled norm, but his advocacy towards a military dictatorship coupled with his extremist views could overshadow his pro-business stance… that being said, how effective he will be at obtaining approvals to policy implementation remains to be seen given his party only have 10% of seats in the ‘lower house’. This week also saw a number of key market indicators released. In the US, consumer confidence beat expectation suggesting demand is still buoyant. This was coupled with a strong set of employment data that saw headline unemployment remain at 3.7% and the participation rate come in higher than expected (62.9%), suggesting there has been a slight reduction in labour market slack. Elsewhere, Eurozone GDP came in slightly lower than expected but unemployment remained stable at 8.1%. The Bank of Japan policy meeting took place on Wednesday with no major changes made.